You won't have a long wait when you order your new bed or mattress from Archers. Many beds and mattresses are available for delivery on a day of your choice and, what's more, it will be delivered absolutely free to your door! Where do I use my Archers Sleepcentre voucher code? Archers Sleepcentre has stores located all over central Scotland from Dundee to Ayr. their website offers the same huge selection of beds, mattresses, headboards, and bedding that you will see instore, in addition to a great range of bedroom furniture, dining room furniture, and living room furniture. They are confident that they are offering you the best possible prices but, should you find an item cheaper elsewhere, they promise to try and match the best price you can find. They deliver their goods throughout the UK and much of their stock is available for collection or immediate delivery. Archers Sleepcentre has bed superstores in eleven locations throughout Scotland in Ayr, Cumbernauld, Dundee, Edinburgh, Falkirk, Glasgow North and Soth, Hillington. Kilmarnock, Livingston, and Uddingston. They stock every type of bed including divan beds, bed frames, ottomans, day beds, sofa beds, children's beds, electric adjustable beds, headboards, mattresses, and bedding. So whether you are looking for a super king for the master bedroom or a novelty beds for the kid's room, you are sure to find something to suit at an Archers Sleepcentre. You'll find every type of mattress available at Archers Sleepcentre. They offer foam mattresses, gel mattresses, latex mattresses, memory foam mattresses, miracoil, open coil, and pocket sprung mattresses. They even have a choice of waterproof mattresses. they come in every size from a small single to a super king and every size in between from leading brands like Silentnight, Rest Assured, Dura Beds, Breasley, Kaymed and more. For more information regarding Delivery, check here. If you wish to return an item, you may do so within 14 days of receipt. To receive a full refund with no deductions, you will need to return the products in good condition and in its original packaging. There is a chargeable for collection refunds of £70 or £120 for adjustable beds. Get more Returns & Refunds information here. find your local store using the Store Locator Tool. 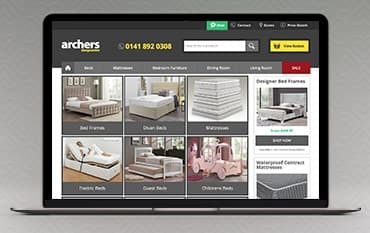 Archers Sleepcentre is Scotland's leading bed specialist, and with UK-wide delivery, a huge selection of beds, bedsteads, frames, mattresses and more, plus furniture for the living room and dining room, you can enjoy their quality and service wherever in Britain you are. Enjoy every sleeping moments by investing on the best beds, mattresses, and bed accessories and with a Archers Sleepcentre discount code, you could even save yourself a few quid. The company understands everyone’s need for quality sleep and this can be achieved with the help of their products. You are sure to wake up fully revived every morning.